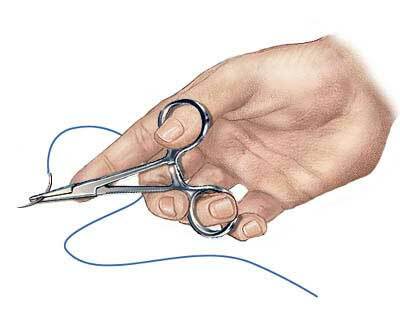 Sutures, or stitches, are the most commonly used method to fix a cut or wound. Other methods are skin adhesives or glue, Steri-Strips or butterfly bandages, or even leaving skin openings alone in some cases. Absorbable sutures dissolve over time. Nonabsorbable sutures need to be removed within a time specified by your doctor. Suture care is similar, regardless of the type of suture. First, keep the wound clean and as dry as possible. Do not immerse or soak the wound in water. This means no swimming, washing dishes (unless thick rubber gloves are used), baths, or hot tubs until the stitches are removed or after about 2 weeks if absorbable suture material was used. Leave original bandages on the wound for the first 24 hours. After this time, showering or rinsing is recommended, rather than bathing. After the first day, remove old bandages and gently cleanse the wound with soap and water. Cleansing twice a day prevents build-up of debris, which may cause a larger scar, make suture removal slightly painful and more difficult, or increase the likelihood of infection. If you develop any of these symptoms, you should contact your doctor immediately for further evaluation. Your doctor may start you on antibiotics. You should also see your doctor for continued bleeding, for removal of sutures, and if the doctorwho placed the sutures recommends that your wound be checked (usually 2 days after placement of sutures). Call your doctor if your sutures fall out before your scheduled time for suture removal because your wound may open up, potentially causing a larger scar.